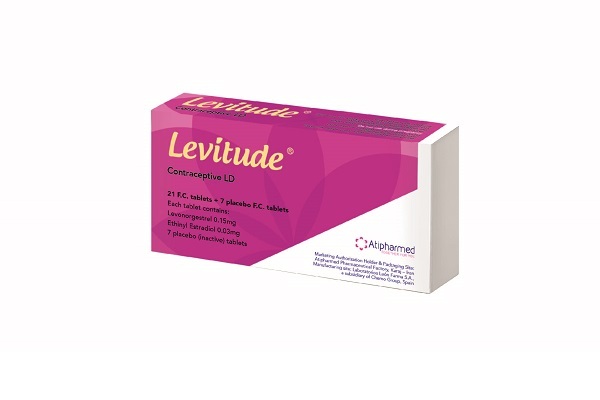 Levitude is the first and only LD contraceptive pill that contains 7 pills of white and placebo without hormone. The efficacy of combined contraceptive pills with a consistent and consequent use is 99.9%, which in case of mistake due to the forgetting of commonly used pills, can be reduced to 91%, but Levitude Due to the presence of 7 placebo pills and the guide for the use of the drug, it provides the consumer with the highest level of efficacy. inhibits the secretion of pituitary gonadotropins. effects on the endometrium that prevent implantation. • Reduce severe and prolonged menstrual bleeding (menorrhagia). Each Levitude blister contains 21 pills of yellow (containing hormone) and 7 pills of white (placebo) (without hormone). Each blister contains 28 pills, with two different pill sizes arranged in sequence. Levitude is given daily basis at a given time (every 24 hours) with or without food. After taking the seventh white tablet, the next pack of the next tablet will begin, whether the bleeding has been discontinued or not. Even with the use of 7 white blood hormone-free pills, protection against pregnancy will be achieved, but it is necessary to use another contraceptive method during the first 7 days of the first course of drug use.